He was a comedy playwright, author of fables and memoirs and a poet. His writing coincided with two great eras in Polish literature: Romanticism and Positivism. A comedy playwright, author of fables and memoirs and poet. A count and comic playwright, writer of fables and memoirs, poet. Born on the 20th of June 1793, at the foot of the Carpathian Mountains in Surochów near Przemyśl to a wealthy noble family, died in Lviv on the 15th of July 1876. He lived to be 82, a long life by 19th Century standards, and for a Polish writer at the time he led an affluent and comfortable life. His youth was eventful. He was educated at home, but his education did not last long because at the age of 16 he joined the Napoleonic army of the Duchy of Warsaw and fought with it for six years - until the downfall of Napoleon's Empire. During the retreat from Moscow he fell ill with typhus, and managed to escape from Russian captivity. He served as an orderly officer in the general staff. For his war-time service, Fredro was awarded the Virtuti Military Gold Cross and the Cross of the Legion of Honour. He left the army in 1815 and settled in Bieńkowa Wisznia, on his father's estate near Lwów (today Lviv, Ukraine). He met Countess Zofia Skarbek (née Jabłonowska) around 1817, and she became the love of his life. When she was 15, Zofia Jabłonowska had been married to Count Skarbek, one of the wealthiest men in Galicia. It was an unhappy marriage and she left him after a few years, but she still waited over 10 years before marrying Fredro. The whole affair is rather mysterious, since Count Skarbek raised no objections and arranging a "church divorce" within that social class was mainly a question of money. The resistance came from the Jabłonowski family, who were probably motivated by notions of propriety. But once the couple was wed in 1828, the marriage was a very happy one. Both of their two children had literary aspirations: Zofia, who became Countess Szeptycka, was the author of Wspomnienia z lat ubiegłych / Memories of Bygone Days, while their son Jan Aleksander was a comic writer. Fredro was very efficient at running the family estate, but was also quite civic-minded. He was active in the social life of the landed gentry, and from 1831 represented their interests in the Galician Sejm (parliament). During the Spring of Nations he was accused of treason for anti-Austrian activity, though the case was ultimately dismissed. He spent the years from 1850 to 1855 with his family in Paris, where he was a member of the Society of Friends of Science and, from 1873, of the Academy of Learning. He spent the last years of his life in Lwów, of which he was an honorary citizen. He died there on July 15, 1876. On the eighteenth of February in the year 1814, a man of medium height, slightly overweight, in a frock coat buttoned up to his neck, in a bicorn hat with no mark but a small tricolour ribbon, rode by on a white horse. Behind him, some distance away, rode a second man, much younger. (...) The first rider was Napoleon, the other was myself. Near the end of his life, Fredro wrote Zapiski starucha. Też trzy po trzy / Notes of an Old Man. Also Nineteen to the Dozen, a collection of proverbs, adages and parables in which he takes a bitter look at human nature and society from the perspective of old age. He also wrote short stories, as well as short and long poems. His fables enjoy a special place in Polish culture, many of them having been absorbed into the popular culture so thoroughly that they are no longer even associated with their creator (such as Osiołkowi w żłoby dano about a donkey unable to make up his mind what to eat, Małpa w kąpieli about a monkey wreaking havoc in the bathroom, and Paweł i Gaweł about two warring neighbours). His writing itself found its way into the vernacular; sometimes we do not even realize we "speak Fredro" ("Wolno-ć Tomku w swoim domku" / "Tom, do as you please in your own home", "jak ty komu, tak on tobie" / "as you do to others, so they will do to you", "szanuj zdrowie należycie, bo gdy umrzesz stracisz życie" / "take care of your health, for when you die, you lose your life" and "jeśli nie chcesz mojej zguby, krokodyla daj mi luby" / "if you want what's best for me, buy me a crocodile, my love" are just a few examples). Fredro's writing coincided with two great eras in Polish literature: Romanticism and Positivism. But he was an era and a literary trend in himself, a link between the rhymed comedy of the Enlightenment and the bourgeois comedy of Young Poland. However, his writing was devoid of the didacticism of the former and the aggression of the latter. His humour was usually quite gentle, and he showed considerable understanding towards the faults of his fellow men. Fredro had fun writing his comedies and wanted theatre audiences to have fun too, thought this sometimes exposed him to violent attack. In an age that glorified national martyrdom and patriotic service, anyone who did not want to help develop, testify to and stimulate patriotic feeling was ideologically unacceptable. Fredro was attacked by Seweryn Goszczyński (in Powszechny Pamiętnik Nauk i Umiejętności, 1835), as well as by Edward Dembowski, Aleksander Dunin-Borkowski (pen-name Leszek) and Julian Bartoszewicz. He was accused of being nothing but a second-rate talent, of succumbing to French models, of immorality, and even - though a eulogist of the Polish gentry tradition - of a lack of national spirit. In any case, Fredro was silent, and the causes for it are still unclear. Perhaps there were personal factors involved; after all, this comic writer did have a penchant for misanthropy, a characteristic that grew more pronounced with age. Fredro's comedies reveal the author's familiarity with both Polish and European comic tradition. They contain references to the Enlightenment-era rhyming comedy of Franciszek Zabłocki or Wojciech Bogusławski, but also to the much older travelling comedy troupe shows (through techniques like changing places or pretending to be someone else). They contain elements of Alfred de Musset (romantic intrigues) and Molière (miserly and hypocritical characters) as well. However, Fredro fills his theatrical world with an array of original figures drawn from the Polish manor house, and later also from the bourgeois home. He presents a colourful cast of characters: noblemen, money-lenders, military men of various rank, wild youths and yarn-spinners, sentimental maidens and calculating ladies, servants of every description, etc. He often gave them names that describe their personalities, such as Milczek (silence), Raptusiewicz (a quick temper), Birbancki (boisterous revelling) and Jowialski (joviality). These characters have a vast array of individual qualities, leading Czesław Miłosz to aptly refer to Fredro's output as "the comedy of temperaments". Apart from his comic characters, the charm of Fredro's works also lies in his bold and very dense situational and verbal humour. Fredro's language is in fact extraordinary. Most of his comedies are written in verse that flows as easily as colloquial speech, without any constraint or effort, though often it is written in a form as sophisticated as the eight-syllable trochee (in Zemsta / The Revenge, for example). Fredro wrote for the stage, mostly for Lwów theatres. His contemporaries claimed he often invented characters for specific actors, whom he even consulted about his ideas. Fredro's son said his father did not go to the theatre, but as Żeleński-Boy rightly notes, the son was talking about the elderly, embittered man Fredro would become, not the rowdy youth he had been years before. The author's stage thinking is actually noticeable in the notes included in the works themselves, which contain numerous suggestions about stage sets, the characters' appearance and how they should be played. Examples include instructions specifying that "places marked with a double comma can be let go in the acting", or that participants in the marked fragment of dialogue should speak almost at the same time. The stage directions often describe the scene very precisely: "The desktops and sofa in place... Orgon dressed to travel, wearing a peaked cap, large moustache, a watch on a wide ribbon etc., behind him the Jews and Servants of the inn". Fredro wrote dozens of plays, ranging from one-act and multiple-act comedies to farces, grotesques and vaudevilles. Until he fell silent, they were quickly taken up by theatres in Lwów, Warsaw, and Kraków. After he resumed writing, Fredro no longer published his works or offered them to theatres; nothing from this later period was published until after his death. The best plays, and those that are best-known today, were written during his first period. His debut was a comedy, not a very successful one, called Intryga na prędce / Hasty Scheming (premiere: Lwów, 1817), later rewritten as Nowy Don Kichot czyli sto szaleństw / The New Don Quixote or a Hundred Lunacies, with music by Stanisław Moniuszko. 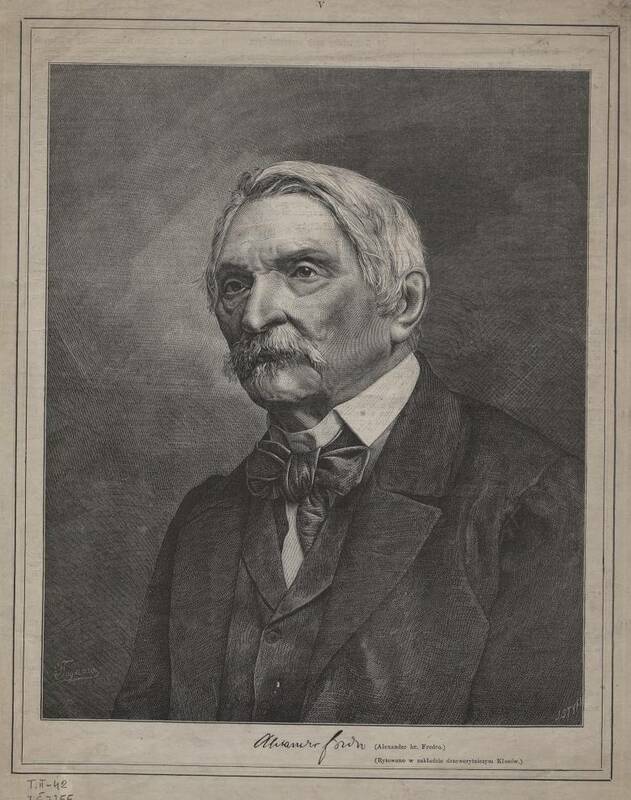 In 1818, with the finished manuscript of Pan Geldhab / Mr. Geldhab in-hand, he went to Warsaw. At first no theatre director was interested, but the play was eventually staged in the capital in 1821. After that, along with inferior pieces, Fredro's greatest comedies premiered in Lviv: Mąż i żona / Husband and Wife (1822), Cudzoziemszczyzna / Foreign Influences (1824), Damy i huzary / Ladies and Hussars (1825), Pan Jowialski / Mr. Jowialski (1832), Zemsta / The Revenge (1833), Śluby panieńskie czyli magnetyzm serca / Maidens' Vows or the Magnetism of the Heart (1833) and Dożywocie / The Annuity (1835). The plots of these plays generally revolve around money, love and marriage, and the main dilemma is whether to marry for money (something the parents or guardians usually want) or for love. The title character in Mr. Geldhab made his money, not entirely honestly, it is suggested, by supplying the military. He flaunts his wealth with all the pride of the nouveau-riche, decorating his home lavishly with the help of the Merchant, the Tailor, the Upholsterer etc., and exhibiting his silverware in public. (At the same time, he fails to pay his ailing sister the allowance he owes her.) He wants to be accepted into high society, with the help of his money, by having his daughter Flora marry Duke Radosław. Hounded by creditors, the duke agrees to a marriage that will bring him a large dowry. Flora also wants to become a duchess, so she rejects the true love of Ludomir, an officer in Napoleon's army. In a twist of fate, Radosław receives an unexpected inheritance from an aunt and, pretending that Ludomir's love has moved him, refuses to proceed with the marriage. Ludomir would have been handy as a consolation prize, but by then he has discovered how hypocritical and calculating Flora is. Mr. Geldhab is one of only a few comedies by Fredro that does not have a happy ending, however the truth behind the ending of Husband and Wife remains unclear. Here is a love quadrangle: Elwira, the wife of Count Wacław, is cheating on him with Alfred, while at the same time both gentlemen are having an affair with the nimble chambermaid, Justysia. According to the ending played in Fredro's day, when it all comes to light the only guilty party turns out to be Justysia, who will be sent to a convent as punishment... but the love triangle remains. This ending exposed Fredro to accusations of immorality, since it fails to condemn dissolution and marital infidelity. However, a posthumous edition published in 1880 had a different ending, though its author is unknown: Justysia is forgiven, as is the unfaithful wife, and morality is saved. In 1938 at the Cricot theatre, Adam Polewka staged the play with both endings. Foreign Influences, like Nikt mnie nie zna / Nobody Knows Me and Mr. Jowialski, explores the motif of dressing up and playing someone else. At Radost's estate, two young men are courting his daughter. To gain the father's favour, Astolf pretends to be an expert on foreign countries and an admirer of foreign fashion. Zdzisław who really does know the world, having travelled extensively with Napoleon's army, pretends to be a simpleton. He is the one who wins, of course, convincing Radost with the maxim that concludes the play: "Wszędzie dobrze, ale w domu najlepiej" / "Foreign countries are fine, but one's homeland is finer". Ladies and Hussars, one of only a few of Fredro's comedies to be written in prose, presents a gallery of characters from the Napoleonic army. It is set at a Major's rural home, where the Major himself, a Cavalry Captain, a Lieutenant, a Chaplain and "two old hussars" are staying. This masculine world is turned upside down by a visit from the Major's two fat sisters, young Zosia (a daughter of one of the men) and a flock of maids Józia, Zuzia and Fruzia. Zosia's mother wants to marry her off to the wealthy Major, but the girl loves the Lieutenant and he loves her back. After numerous plot twists and misunderstandings, Zosia marries her beloved and the Major bequeaths his wealth to the young couple. Mr. Jowialski, also in prose, is one of Fredro's most interesting comedies. At Mr Jowialski's estate in Pustakówka, there lives an extraordinary cast of characters. There is the proprietor himself who is old and senile (or at least pretends to be), his wife, his son the Chamberlain, a man who seems weak-minded and is completely engrossed with catching birds and building cages, and the Chamberlain's wife, whose favourite pastime is reminiscing about her first husband. There is also Helena, the Chamberlain's niece, and the provincial nobleman Janusz who is courting her. The Chamberlain's wife insists on the marriage. Helena hesitates because a loveless union seems unromantic to her, but is also concerned about the fact that she's getting older. In the mean time, Mr. Jowialski loves good fun and forces everyone else to enjoy themselves, too. Janusz sees an opportunity when he finds a sleeping man, and this is how the comedy starts. Ludmir the poet and Wiktor the painter are resting in a meadow, in the middle of a sightseeing tour that seems to be taking them from one inn to the next. Ludmir pretends to be asleep while Janusz plans his prank: they will kidnap the sleeping man and convince him he is a sultan. Ludmir joins in the fun and pretends to be Kurek, a shoemaker who finds himself mysteriously transformed into a ruler. This allows him to manipulate those around him, to tell everyone unpleasant truths and gain Helena's favour, all the more important because she is wealthy. The protests of the Chamberlain's wife are silenced when it turns out Ludmir is her son who went missing when he was a baby. In this comedy Fredro uses a variety of different elements: the aforementioned dressing-up, a romantic journey in the wilderness, a romantic maiden and the sentimental motif of a missing baby found years later thanks to a birthmark on his hip. What carries this story, though, is the title character; Mr. Jowialski forces everyone around him to act silly, speaks in dictums and proverbs and has a fable for every occasion. However, it's never quite clear if he really is senile, or if he just likes poking fun at everyone. Perhaps he clowns around to conceal some major void in his life in Pustakówka, or his bitterness at watching his family degenerate. Contrary to many of Fredro's plays, it is not money that is the root of matrimonial difficulties in Śluby panieńskie / Maidens' Vows, a light, merry and charming comedy. Having decided they do not really like men, two maidens are resisting all their suitors and swear they will never marry. However, thanks to the perseverance and scheming of the gentlemen and the irresistible magnetism of the heart, the maidens' vows are finally overcome. The comedy's charm lies in the amusing contrasts of the characters, gentle Aniela with ambitious Klara, and the cunning joker Gustaw with sentimental Albin. The plot of Fredro's most famous comedy, Zemsta / The Revenge, is set in two households: that of Cześnik Raptusiewicz and Rejent Milczek, both living in part of an old castle. Cześnik is a violent man, while Rejent is a sly hypocrite. The quarrel between the two households is over the wall dividing them, which Rejent keeps trying to build while Cześnik pulls it down. Rejent has a son, Wacław, and Cześnik has a niece, Klara, the perfect recipe for a romance cursed by a family feud. Rejent wants Wacław to marry the pretentious widow Podstolina because he (wrongly) thinks she is wealthy. The cast of characters is rounded out by Dyndalski and Śmigalski, members of Cześnik's household; Perełka the cook; masons building the wall, who keep getting chased away; and the comical Papkin, a braggart, a clown and a coward. The young lovers' worries and the family feud both disappear thanks to the perverse revenge that Cześnik cooks up: to spite Regent, he lures Wacław with a letter allegedly written by Klara and "forces" the two to marry. This is Fredro's most frequently staged comedy, and its ending is the apotheosis of the gentry's way of life and national harmony. Most of the comedies staged within Fredro's lifetime are set in gentry households, idyllic places despite the scheming and disputes, which respect tradition and cultivate family values. But the location changes in Dożywocie / The Annuity, a harbinger of the second period of the author's work. The plot unfolds in a country inn where Łatka the money-lender and Leon Birbancki, a young wastrel, are staying. Posing as someone else, Łatka buys Leon's annuity and is suddenly concerned with keeping him alive as long as possible. He appoints Filipek, his servant, to watch over Leon's health as he himself tries to sell the annuity to another money-lender, Twardosz. Prone to all-night partying, Leon does not make his task easy, since he always looks and feels terrible. Also staying at the inn is Orgon, an impoverished nobleman who wants his daughter Rózia to marry Łatka. Leon and Rózia become lovers, but of course a lack of money stands in the way of their happiness. After many plot twists and a pretended suicide attempt by Leon, there is a happy ending when Leon recovers both Rózia and his money. Love wins out in practically all of Fredro's comedies. In his world, true love overcomes all obstacles, including family resistance, scheming and financial complications. This was precisely the creed of a writer who was accused of being immoral, one that emphasises the value of love, family life and home virtues. Fredro filled his gentry world with a cast of original, unique individuals in a variety of comic incarnations, ranging from the farcical and grotesque to the gently humorous. However, these characters are often more profound than they appear. Who in truth is Jowialski? How much bitterness and helplessness lies beneath Papkin's chattering? What suppressed needs are reawakened in Birbancki's mind when he gets euphoric over a balloon flight? Many great actors have given outstanding performances that offer different answers to these questions. The plays themselves are open to a variety of interpretations. After returning from Paris, Fredro took up writing once again, however he never returned to the idyllic nobleman's manor. He sensed that this world was a thing of the past. What replaced it was contemporary Galicia, with all its deprivation and pretentiousness. Fredro's new plots unfolded in small towns (Z jakim się wdajesz takim się stajesz / You Become Who You Associate with and Jestem zabójcą / I am a Killer), town houses and hotels (Ożenić się nie mogę / I Cannot Marry), railway stations and restaurants (Z Przemyśla do Przyszowa / From Przemyśl to Przyszów). If a rural manor appears, it is only in the context of bills of exchange and loans, Galician officials, landowner associations and dissatisfied peasants (Wielki człowiek do małych interesów / A Great Man for Small Business and Wychowanka / The Ward). If there is a country cottage, it is nothing but a stop on a coach journey. Money, business, clerical ambitions and women on the way to emancipation all replaced the earlier stories of romance. One character is the "great man for small business" (a play that premiered in Lwów, Kraków and Warsaw in 1877), landowner Ambroży Jenialkiewicz. His mind is bursting with great ideas that he writes down and then cannot decipher. He invests, runs the estates of young relatives and plans their marriages. He schemes to make his friend a director at the Loan Society. Although nothing ever comes of his plans, he is satisfied. He claims that everything always goes the way he wants with just minor modifications, and he never stops his conniving and futile calculations. Rewolwer / The Revolver, a grotesque play with a prop as the main character, is an unusual piece from this period. First of all, the plot is set in the 1850s in Parma. Secondly, politics is involved. It is the era of Charles III, and the atmosphere is thick with plotting, surveillance and police violence. This is the world in which Baron Mortaro, a banker and speculator, conducts his shady business, prepared to cheat even his lover and his friend. A package containing a revolver falls into his hands, a dangerous thing given the political situation. One of Fredro's stranger inventions is the character of Paolo, the "dumb commissioner" who speaks in sign language that Mortaro then translates out loud on stage. It is Paolo's fault that the revolver, which Mortaro wants to get rid of, keeps coming back to him. In the end the wretched object turns out to be nothing but a cigar cutter. Also worth mentioning from this period is Brytan Bryś / Bryś the Hound, a "dramatic tale in verse" in which, rather like Orwell's Animal Farm, animals play various social roles. In Poland, Fredro is the writer whose works are staged most often. All the greatest 19th- and 20th-century actors have acted in his comedies, including Antoni Benza, Jan Nowakowski, Apolonia Kamińska, Adam Żółtowski, Józef Rychter, Bolesław, Jerzy Leszczyński, Antoni Hoffman, Stefan Jaracz, Józef Węgrzyn and Mieczysława Ćwiklińska. Helena Modrzejewska's Aniela and Ludwik Solski's Łatka were historic performances. After 1877, theatres in Lwów and Kraków began staging works unpublished in Fredro's lifetime. When Stanisław Koźmian was the manager of the Municipal Theatre in Kraków, the repertoire included 14 of these plays. In the 19th century Fredro's plays were staged as contemporary drawing-room comedies, which did them little harm since any historical references, mostly to the Napoleonic era, were incidental. Then with the Young Poland movement there came a fashion for Empire-period stylisation with the help of historical costumes and sets. Theatrical experiments appeared in the 1920s and after World War II, including a bold staging of Damy i huzary / Ladies and Hussars by Jaracz (1932), Leon Schiller's version of Nowy Don Kichot / The new Don Quixote with music by Moniuszko (1923), Maciej Prus's Śluby... / Vows... (1971) and Grzegorz Jarzyna's Magnetyzm serca / Magnetism of the Heart (1999). The most important post-war productions in the style of the author's era include Maidens' Vows directed by Władysław Zawistowski (Stary Teatr in Kraków, 1956), Andrzej Łapicki (Teatr Polski in Warsaw, 1984), The Annuity (Teatr Współczesny in Warsaw, 1963), A Great Man for Small Business (the same theatre, 1968) by Jerzy Kreczmar, The Revenge by Gustaw Holoubek (Teatr Dramatyczny in Warsaw, 1970) and Zygmunt Hübner (Teatr Powszechny in Warsaw, 1978). Fredro's works have been translated into many languages, including English, French, German, Russian, Czech, Romanian, Hungarian and Slovakian. Zemsta / The Revenge was adapted for the screen by Antoni Bohdziewicz and Bohdan Korzeniewski in 1956 (premiere: 1957) with Jan Kurnakowicz, Jacek Woszczerowicz, Danuta Szaflarska and Beata Tyszkiewicz as the main characters and by Andrzej Wajda in 2002 with Janusz Gajos, Andrzej Seweryn, Daniel Olbrychski and Roman Polański. Critical edition: Pisma wszystkie / Complete Works vol. 1-15, Warsaw 1955-80.